won first prize in a national competition in 1966, followed by another first prize in a contest organized by Tokyo Radio, and first prize in the Concertino Praga International Radio Competiton. While still in Tokyo, she became a pupil of Professor Marie Hlouňová who was then teaching in Japan. Ishikawa then followed her to Prague, where she studied from 1970 on a scholarship granted her by Czechoslovak Radio. Subsequently, she won laureateships from Henryk Wieniawski International Competition in Poznań (1972), Queen Elizabeth Competition in Brussels (1976), and Fritz Kreisler Competition in Vienna (1979). As a nineteen-year-old she made her debut solo appearance with the Czech Philharmonic Orchestra, and at the age of twenty-one appeared for the first time at the Prague Spring Festival. She joined the Czech Philharmonic Orchestra during its tour of Japan. As a soloist of the Tokyo Metropolitan Symphony Orchestra and the Japan Philharmonic Orchestra, she appeared on the concert platforms of Europe´s music centres and at festivals in Warsaw, Zagreb, Budapest, and Helsinki. In the late 1970s she started studio work for various broadcasting and record companies. There, she engaged in numerous joint projects with the Czech Philharmonic and the Brno State Philharmonic Orchestras, the Dvořák Chamber Orchestra, the Prague Chamber Orchestra, Capella Istropolitana, and the Württemberg Philharmonic Orchestra. Her recordings are available on discs released, in the Czech Republic, by Supraphon, Lotos and GZ-Digital Media; and in Japan, by Exton Octavia Records. A significant share in her repertoire has been assigned to Czech music. Beyond that, her concert programmes have been characterized by marked focus on virtuoso violin literature. Since 1997 she has been a member of the Kubelík Trio with which she has regularly appeared on the world´s chamber music platforms. 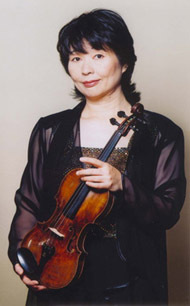 Miss Ishikawa currently performs on violins built in the workshops of Geronimo Amati II (c. 1690) and Pietro Ambrosi (1727).